People are cheering that the U.S. economy is finally back to operating at its full potential, eight years after the global financial crisis ended. “U.S. Economy Reaches Its Potential Output for First Time in Decade,” the headlined its story on Nov. 29. “The crisis is officially over,” Deutsche Bank AG chief international economist Torsten Slok wrote in a Dec. 1 note to clients. This chart makes the point. The red line represents gross domestic product. 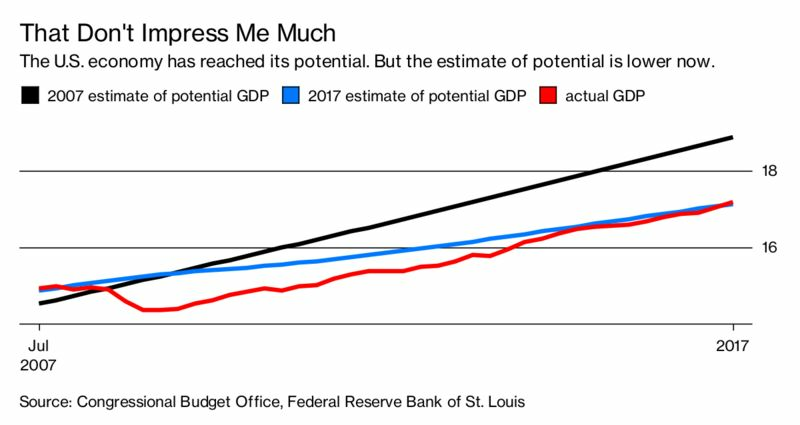 It just managed to cross the blue line, which is the Congressional Budget Office’s estimate of potential GDP. The crossover means the economy is producing as much output as it can without overheating. The low unemployment rate—4.1 percent in October—is a reflection of that. If output of goods and services were much greater, inflation would be likely to break out. Economists disagree over why potential GDP is so much lower now. Some argue that the CBO was too optimistic back then, others that it’s too pessimistic now. Some say that the financial crisis itself did lasting harm to the economy—some workers who lost their jobs never came back, reducing the economy’s productive capacity. Harvard economist Lawrence Summers argues that the world is in the grip of a prolonged “secular stagnation” (PDF). It’s clearly not a good thing that the U.S. economy is maxing out at a relatively low level of output. But if the secret to happiness is lowering your expectations, as some people say, maybe we should all be happy now. Peter Coy is the economics editor for Bloomberg Businessweek and covers a wide range of economic issues. He also holds the position of senior writer. Coy joined the magazine in December 1989 as telecommunications editor, then became technology editor in October 1992 and held that position until joining the economics staff. He came to BusinessWeek from the Associated Press in New York, where he had served as a business news writer since 1985.